Cecilia wakes up with some kind of eye infection. Not a pink eye, but it is weepy and problematic. We tumble out of our hotel room and somehow choke through the usual hotel breakfast for yet another day that begins at the sewing shop. This time we’re going to do the Grandma re-shoot. I will now surprise you completely by suggesting that no one is thrilled. Posion Killer – Thiha’s remedy for Minshi. 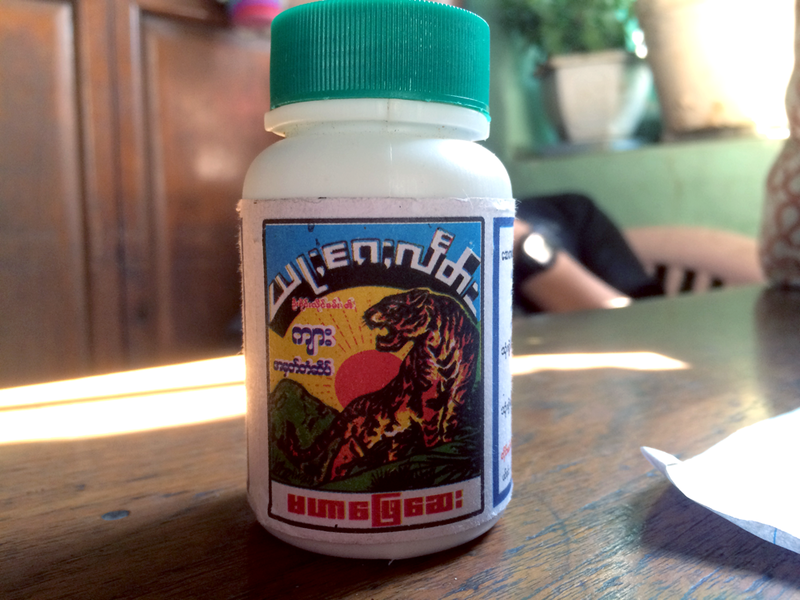 It has a tiger on it so it must be good. Minshi’s stomach is better now – he devours two whole persimmons without even bothering to peel them. 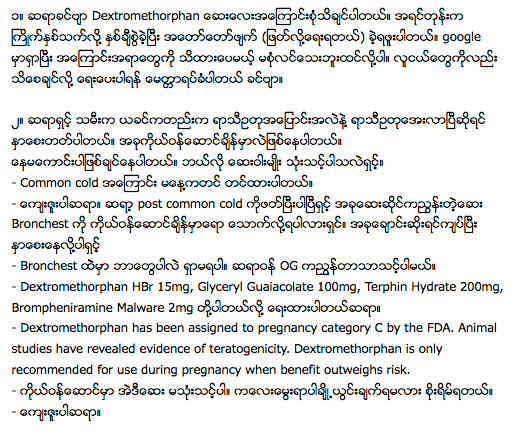 Thiha asks about my cough and BRONCHEST. Of course nothing has changed. But I tell him this disease a bad one, it might not clean up so soon. There is also a general sense of remaining dread about the second act problems which still have not been directly addressed. We did have our meeting, we did devise some diversions that should help in the second act, but none of them felt substantial. 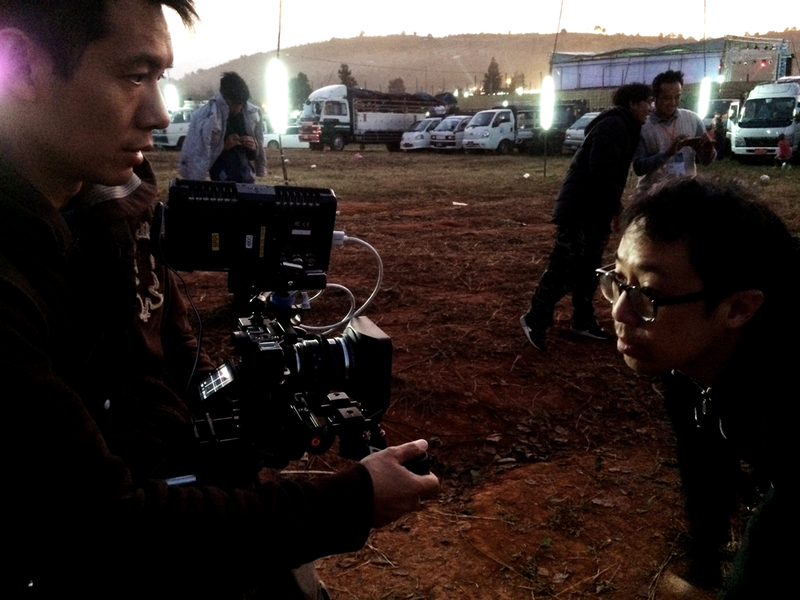 We shot all those, but there is still the feeling that maybe we have not provided enough in the way of complications. Or maybe we’re fine. We have two days of shooting left. Unfortunately, Gavin is clearly vamping now and no one can help him. We’ve given him all the suggestions we can, but there is no “magic bullet” for these situations. This mission is a lonely one; the creative person could be struck by sudden genius (sadly, this is unlikely, even for geniuses), he could fail utterly, or – most likely – he will waffle about shooting until time runs out. Some of this waffling may end up being used in the end. Only the edit will tell. I have such faith in the editing process that I’m convinced we’ll have something, but it may be miles away from what Gavin wants, simply because he has never determined what he wants and has done even less to get it. 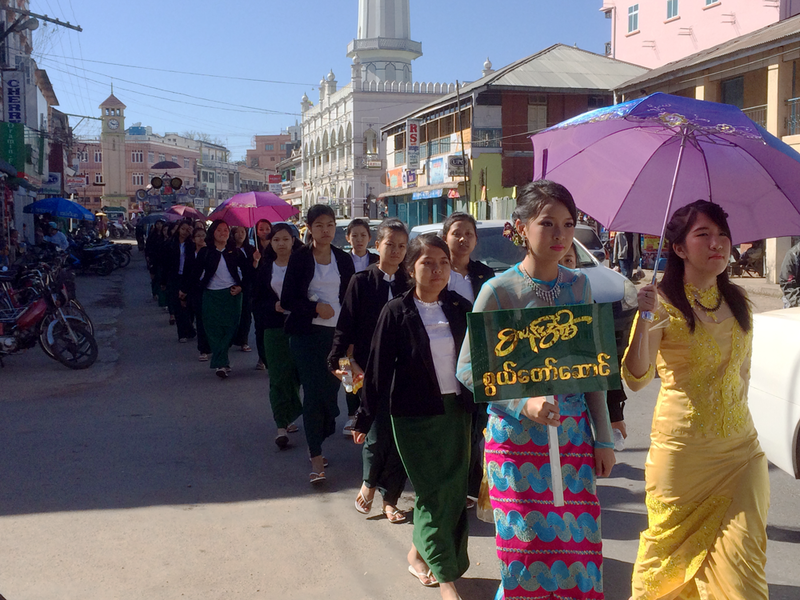 It’s very close to the actual calendar date of proper Buddhist holiday festivities, even though the Balloon Competition has already begun. 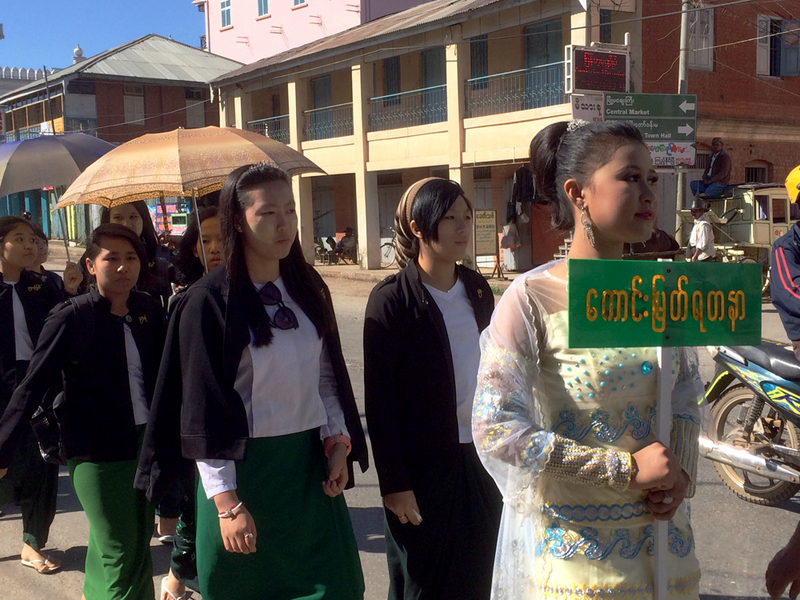 So a huge parade marches down Mandalay-Lashio road, the main drag in Pyin Oo Lwin and the location of the sewing shop. It destroys the sound in our shot – what can we possibly do? It’s a giant parade, with marching high school kids, trucks playing music, and row after row of participants waving and holding banners. Keep rolling! The sound edit on this movie will be a disaster anyway. Then it’s a reset for the re-shoot with Grandma. Tinmar Aung is in good spirits for it – she goes right to work relearning her lines and working on them with Grandma while we set lights. She’s been loving the excitement of the Balloon Festival. We get the impression that though some of the holiday reaches her in the orphanage the full effect would only be possible if someone took the whole orphanage to town, which is a bit on the impossible side. After 12 takes we get the scene, which has – once again – been played all in one difficult long take, rather than covered. Nine of these takes were Gavin trying to get more out of Tinmar Aung, so we’re good with that. Any work that improves the film is welcomed no matter how tedious. You can feel it all getting better. Grandma, however, is a lost cause. Gavin confesses in the van on the way to a lovely Indian lunch, that he’s worried about editing. Again. His schedule for today consists of a grab bag of wide shots and details he hopes will come of use in the cut. I’m not at all convinced. It seems like waffling to me. After we stuff ourselves with Indian food we go back to the sewing shop and, instead of shooting more extraneous stuff (we do have oh-so-much of it already!) we have a big powwow about the story. I’m of the opinion that there is probably enough of a movie here, it’s just that the editing strategy will quite possibly be very different than what Gavin planned. Which means that scenes planned for the beginning – even for the opening! – must be considered for the middle or end of the film. And vice versa of course. If everything can be used flexibly, I think we’ll have something – more than enough of something. This speech must be somewhat influential, or maybe Gavin is just tired. He agrees we have enough, and that no amount of extra B-roll is going to save it if for some reason we do not. It’s a relief. I’m coughing so much right now I would swear I’ve got walking pneumonia again. It’s just a dry hack wheeze and it feels like I’m drowning. And so I wait for Gilbert. He will be late, as usual, but when he does arrive I wire him up in two minutes and we’re out the door. The road to the Balloon Festival is super bumpy – you can’t drive more than 10 mph on it if you want to keep your axles. It connects to the main highway that was apparently “paved” only a week ago. Paved? Tamped down is more likely. It’s all just soft sand pressed into place. Yes, it’s better than the bumpy dirt road, and higher speeds are possible. But it’s still rough going. We park and unload at the opposite end of the festival. Yesterday when we were trying to leave we saw this area, kind of a parking lot but covered in fluorescent lights tied to trees. The sheer electrical danger these makeshift devices pose is not to be underestimated. But they look great, and we had decided yesterday to shoot at this location, sound permitting. We could have done it, too, if Gilbert’s lines were ready. Today the noise is unbearable. We’re told that a concert will begin at 8PM, and at 6:30 there is a PA blasting pop nonsense at levels so high we can feel the bass pulse from out in the field. The male mosquitoes are back as well. Gavin does two or three takes hoping to get something, but it’s just too damn loud. Gavin is upset – it would’ve been less noisy last night, but then Gilbert was not ready. We break, totally frustrated, and get back in the van. The crowds are insane, much worse than before. The van with Salai goes the opposite way out and they get sort of lost. Thiha also tries to get around the crowds and we get similarly lost. Which is to say not that we cannot tell where we are, but that we don’t know how we can get through. Thiha somehow pilots the van to turn around in the middle of the street. The width of the street is only about a foot longer than the van. We’re surrounded by people. How we’ve not crushed five babies and ten grandmas by now I’ll never know. Since we went different directions we have to stop and regroup. By the time they arrive, Gavin is actually quite angry, probably angrier than I’ve ever seen him before. I can tell because though he seems to have it all under control he slams the van door so hard it rattles on its hinge. But he’s got a better idea, that Gavin. The road to the lake is probably not very crowded at night, and we can get it to look like the edge of the festival pretty easily. And it’s quiet. We hightail it to the new location and, indeed, it is perfect. But by that time, 7:40 PM, Tinmar Aung is kind of wiped out and grumpy. She’s asleep at this point, waiting for something to happen; she is just a little girl. So we have to take her home, but we plan we’ll return tomorrow for this shot. The night is still kind of young, so we decide we will go back to the impossible festival to get the shot of Gilbert we’re missing. I could kill that guy right now – all this back and forth is pretty much due to him not being ready. But when we get back on the road towards the festival we see a traffic jam in progress. In Myanmar, if there are two lanes in either direction, and the two proper lanes fill up to a stop, people will just start driving in the wrong lanes – into potentially oncoming traffic, mind you, until they are filled. Minshi and I see it first. We can tell this is going to be bad. But though we keep yelling from the back to turn around, no one does, and Gavin keeps pushing forward. The traffic starts getting slower and slower. Then we see that the left two lanes are stopped as well. Thiha is not optimistic. We’re stuck and we’re not getting out, not until after midnight. The party is starting in the street now, with people spilling out among the cars and walking the distance to the festival and just leaving their parked cars in the middle of the road. Gavin wants to follow – how far to the grounds? Thiha says it’s two miles. Carrying equipment. We’re all gung ho to do it. But Thiha is not so positive about it. “This is not good, these people,” he says, “they are… they are a rough sort of person.” He points out the front windshield where two guys with their shirts off have begun to punch each other while their buddies swill from bottles and cheer them on. He’s got a point. A whole crew with crazy equipment walking two miles? We won’t make it without some incident. Thiha thinks we can turn around – at least we’ll be in position to leave when leaving is possible. He cranks the motor in gear and starts inching the van around. When he gets the front of it parallel to the road, the front wheels slip off into that soft, soft sand at the edge. The wheels spin. We ain’t going nowhere. Once again, it’s Minshi and I who leap into action. We start jamming things under the wheels, pushing the front of the van, anything to get traction. I find a chunk of what looks to be concrete by the side of the road and ram it under the back wheel, and that seems to be the trick. The van finds purchase and nearly crashes into another pickup parked beside us. As usual, Thiha has it all under control. He backs the van around and we’re faced the other way – pointed right at another car. Thiha expects we’ll be here until after midnight, and we start getting used to the idea. We have snacks, we have a deck of cards. We all like each other. We can wait this out. But there is sudden movement in front of us – it looks like we can drive around the parked car facing us and may even get back to the hotel now. Thiha jumps on it, and after a little inching and flirting with that soft edge we are in the clear. We’re happy, but also despondent at not being able to shoot anything. The day has largely been a bust. And we’re also starving. Thiha to the rescue again! He suggests the night market and a good place he knows to get food. Everyone brightens up. There’s a catch – Thiha has a friend who owns a place in the market, but it’s not as good as the other one, so he needs to hide, his hooded sweatshirt pulled up tight to “disguise” himself. The other place has great noodles and absolutely delicious grilled fish. It’s one of the tastiest meals I have had in Myanmar, all the better for the company and because it’s an end to a crappy day. Plus the whole thing comes out to less than ten dollars for the entire group to eat. This is also the cheapest food we’ve ever had here. Thiha likes hearing us babble on in English, but sometimes we lose him, we’re going so fast. He tells us this so plainly and gently that I’m stunned for a moment. Later that night we watch the dailies of the Grandma/Tinmar Aung scene and confirm that it was worth doing. So at least the first part of the day was worthwhile.